Portable DVD players for car headrests are a great way of entertaining backseat passengers such as children. They simply connect to the rear of the front seats and have a range of power source options from batteries to 12V cigarette lighters. 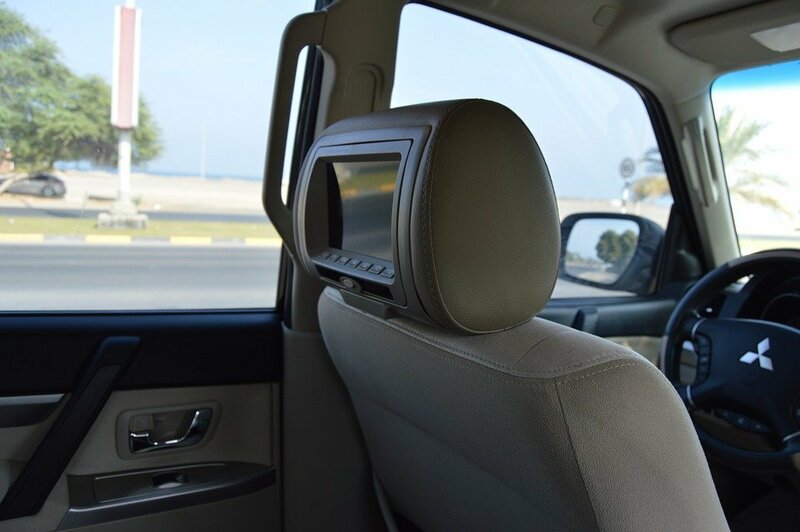 The best headrest DVD player is the eRapta Second Generation, which features a sleek 10 inch HD display and connects easily to the back of the headrest. Headrest DVD players are perfect for road trips and to keep children entertained so that you can focus on your driving. Over the years, the picture quality has improved greatly and the price has dropped, which is great for consumers. There are many cheap headrest DVD players that do not compliment your cars interior. Spending a small amount extra will completely transform the experience with the likes of HD quality, touchscreen functionality, games and much more. When purchasing a headrest DVD player, you have the choice of purchasing one that is integrated into the headrest or one that is portable. Both have their own benefits and it is a matter of personal preference that suits your requirements. Increase the enjoyment for your backseat passengers with high quality video, games and other impressive features. Below is a list of the best headrest DVD players that compliment your car and provide a range of intuitive features. The eRapta is a portable DVD player for a car headrest that connects simply via 2 brackets and fixing screws. It is powered by the cigarette lighter in your car but as it is portable, you can use a standard wall outlet too for home usage. With 10.1 inches of screen, it is a large car DVD player that provides HD quality for both videos and games. It does lack touchscreen functionality but there are intuitive buttons below the screen and this will keep the screen cleaner and free of fingerprints. Overall, the eRapta is the best headrest DVD player that is highly portable and features high quality HD video output. It is fairly expensive but eRapta offer 2 years warranty for peace of mind and it is not just limited to usage inside the car. The Xtrons are not portable as the DVD player is integrated within the headrest. This means you are able to replace your current front seat headrests with the Xtrons, which will swap easily with the majority of OEM headrests. One feature that is very intuitive is the zippered covers, which keep the DVD headrests hidden from criminals. The touchscreen capabilities also make this device fairly easy to navigate around the interface and play games or DVD’s. It is worth mentioning that if you have an active headrest system, this headrest DVD player may not be advisable. However, it is the best built in headrest DVD player for a car headrest available and comes with a range of features. Naviskauto has the largest screen within this article at 10.1 inches and a thin frame that gives it a sleek finish. It is a portable headrest DVD player that has been designed to be easily removed from the headrest and taken out of the car. Overall, the Naviskauto is one of the nicest monitors to look at with the thin and rounded edges. It does lacks touchscreen functionality but it is relatively cheap considering the screen size and the amount of features integrated within the unit. Autowings is a high end headrest DVD player for your car with an intuitive user interface that is simple to use for children. To navigate through the system, there is a remote control as well as touchscreen with instant responses and zero lag. It is a full HD monitor that displays video at 1080P and has compatibility for MP4 MKV AVI RMVB MPG MOV and VOB. There is even 2 RCA cables that allow for both monitors to play the same video simultaneously so that the two passengers can watch the same video. Compared to the XTRONS alternative above, this headrest DVD player is far more attractive to look at but does come at a cost. The more premium look and feel makes it a look like an OEM optional extra. The Rockville headrest monitors are targeting those on a budget and are available with a range of options. For example, they offer their headrest DVD players as a 7 or 9 inch display and a touchscreen option too. Rockville are known for their car amplifiers and other audio components. Therefore you can rest assure this device will live up to the brand in terms of build quality and long lasting electronics. For long car journeys, a headrest DVD player is a cheap and convenient way to entertain passengers. Portability is a key feature that many look for to reduce car crime as well as ensuring the car has the OEM look. There are several types of monitors you can buy that will be discussed further down. DVD players have come along way in the last century and many include features such as touchscreen and games. Before, the only input was a single disc and operation was via a dull looking user interface. Thankfully, as technology ages, prices decrease and the amount of kit you can get for your money nowadays is excellent. Before choosing the best headrest DVD player for you, build up your knowledge with some important key factors below. Ceiling mounted devices can leave permanent damage to the headliner and in terms of the viewing angle, it can cause stress upon the neck. Some of the double din stereos include DVD output footage but cannot be played when driving. Most countries have laws due to the distraction that it can cause to the driver but of course it can be modified to run all the time. Mounting the DVD player inside or hook onto the headrest is the best method in terms of cost, reverting back to OEM and the viewing angle. Due to the small dimensions of the screen within the headrest, its crucial the quality is crisp clear. HD quality is a must these days and without it, the latest file formats will not be able to play on the DVD themselves. Monitors that you can adjust the aspect ratios and brightness are highly desirable but so are the sizes of the monitors themselves. A bigger display will almost certainly improve the quality of the footage. The maximum you will find in terms of headrest DVD players will be between 10 to 11 inches. Try to avoid monitors that are below 7 inches as these will be hard to view for long periods of times due to the smaller size. The ability to click through to certain areas of the DVD player operating system via touchscreen is a big bonus. Not only from a design point of view (less bulky buttons) but it also makes navigating to settings or video footage much easier. It is advised not to have a screen size less than 9 inches for touchscreen device. If the screen is too small, choosing buttons may result in accidental clicks and so forth. The only drawback of the touchscreen functionality would be a buildup of dirt and markings on the screen that would need to be cleaned. Included within the bundles of the monitors are usually wired headphones but premium devices include IR technology. This lets users use wireless forms of output such as headphones to listen to the video footage. Some even include FM transmitters that work very similarly to Bluetooth FM Transmitters so that the audio comes through the car speakers. Technology is improving each year and the number of features a DVD player has is increasing. From the ability to play 8 to 32 bit games, remote controls, game controllers and multiple inputs, the list is endless. Storing the films on a USB is the best method as you do not need to store a large collection of DVD discs within the car. Investing in a quality headrest DVD player can make a huge difference on long journeys. In particular, young children really do not enjoy long periods in the car but choosing one of the recommendations above can keep them occupied for hours on end. With built-in games and other features, they have come along way over the years. Portable headrest DVD players are the most popular as they can be used in a range of applications. If you opt for a DVD players that is built-in the headrest, be sure to cover it when you park your car up. Criminals may be tempted and even if you have a car alarm installed, they can easily get away with the DVD player in a matter of minutes.